The action that warm takes is to release things. Like when you lay in the sun and all of your muscles slowly soften–necks get longer, breaths go deeper and time slows to the speed of a nap. When that softness reaches your heart, then you know what acceptance feels like. ← A Rescue Training Journal, Told from Two Viewpoints. Yay, and nap on to enlightenment! Anyone who sees this and doesn’t feel the warmth and slow their breathing must be comatose! Loved this one Anna. You have a gift. The way you write and describe is beautiful. I lost my boy this week. Your words and beautiful and flaming. So sorry, I honor your loss. As he flies free, we are left especially earthbound. So very sorry. What complete relaxation! And it FEELS so good. To Barbara Cohen – so sorry for your loss – I know what that feels like too. Leaves such an empty hole in your heart. Anna – spent the morning (!) on the Ruby Ranch site! What a great rescue – I am so impressed with all they do. Loved looking at all the horses & how far many of them have come. The site itself is super and the community outreach certainly works. I couldn’t agree more, I am privileged to be a small part of that rescue. http://www.rrhr.org. Love live rescue!! 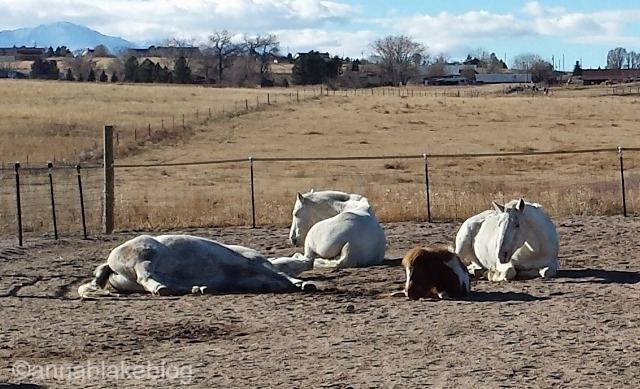 I always want to lay in the sun surrounded by horse. I do have an Arabian mare who is at a beautiful farm.